Perhaps the most important purchase a bride and groom will ever make, an engagement ring serves as a lifelong symbol of the couple’s loyalty and affection for one another. For centuries, diamonds have been the stone of choice for a vast majority of engagement and bridal rings. Traditionally, the groom-to-be is responsible for purchasing the ring for his fiancée, but many of today’s modern couples shop together to ensure that the bride receives a ring that suits her preferences. Determine your budget. Although an engagement ring isn’t something you should skimp on, it shouldn’t drive you into debt. The general industry standard calls for spending two to three months’ salary on a diamond, but this can vary based on the amount you’ve saved, your monthly cash flow, and your standards of quality. Before starting the shopping process, set a maximum threshold and do your best not to exceed it. Put the loose diamond first. You can always swap out the setting of a stone, but the diamond itself will be on your finger forever. If necessary, be prepared to compromise on the setting if it will allow you to purchase higher-grade loose diamonds. For those on a limited budget, a classic diamond solitaire set in a simple gold band can be a great option—you can always upgrade for a future anniversary. When choosing a shape, be sure to select one that complements your personal style and will retain its appeal through changing trends. Make sure it’s certified. When selecting a diamond, make sure it’s a GIA certified diamond, the most respected and rigorous gem laboratory in the world. Other reputable agencies include the European Gemological Laboratory (EGL) and the American Gem Society (AGS). These organizations carefully examine and appraise each stone to ensure its authenticity and value. You should receive an appraisal certificate with your diamond detailing all of its characteristics. Know the 4 C’s. When shopping for a diamond engagement ring, the most important elements to consider are cut, clarity, color, and carat weight. It’s important to educate yourself on the standards of a high-quality diamond before you begin shopping. 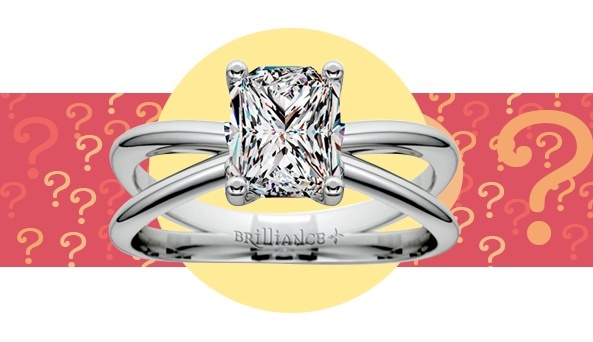 Brilliance offers diamonds that are certified by GIA, AGS, EGL, HRD, and IGI and that can suit any bride’s style preference and budget. Our assortment includes only premium diamonds that have been assessed by GIA-trained diamond and jewelry experts, so you can rest assured your stone will beautifully blend quality and value. Shop our collection of engagement rings that includes tiffany-style solitaire settings and designer settings with side stones.